Osteoporosis affects one in three women and one in 12 men, is responsible for 200,000 breaks per year in the UK and 40 deaths a day. It is often known as a silent illness, because many people do not know they have it until it is too late. Although it is thought of as a disease of old age, latest research suggests its roots lie in adolescence. Osteoporosis is a weakening of the bones that can lead to breaks which are difficult to heal - hence its alternative name, brittle bone disease. 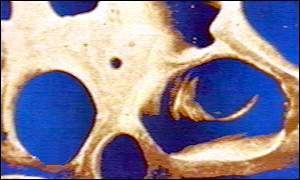 Bones are made up of a thick outer shell with a honeycomb mesh inside. Osteoporosis occurs when the gaps in this honeycomb become bigger making the bone fragile and brittle causing them to break easily. The wrists, hips and spine are particularly at risk. During childhood and the teenage years the skeleton grows and develops, with the bones getting longer and the internal mesh becoming more dense until they achieve their greatest density when a person is in their late 20s. A natural part of the ageing process is that bones get weaker in people over 30 and the honeycomb becomes less dense. However, in some cases this occurs faster than in others leading to osteoporosis. A poor diet in youth can also lay the foundations for the disease in later life. Women are particularly at risk because they have smaller more fragile bones to start off with. This is complicated by the menopause during which the body stops producing oestrogen - a hormone essential for good bone health. And because of the natural ageing process, the risk increases with age. However, more and more research is indicating that the disease can affect younger people, with the National Osteoporosis Society reporting an increase in incidence of the disease among young women, particularly those who are underweight or who have suffered anorexia. Diet and exercise are the two key preventive measures. The Chartered Society of Physiotherapy says skipping, jogging and aerobics are the best exercises to beat the disease. A high calcium, well-balanced diet throughout life but especially while the body is still developing is recommended. Dr Nicola Keay: "A balance is essential"
Dr Nicola Keay, an osteoporosis researcher who has studied the effect of the disease on young women, said there were dangers in failing to find a balance. "If you're doing too much exercise or don't eat enough, or if you don't do any exercise and eat lots of fast food, those extremes obviously aren't good," she said. "The message is to get a balance - do enough exercise, eat a reasonable diet and don't go on a crash diet at 10 or 12 worrying about being too fat because it's the worst thing you can do for your bones." Gentle exercise can help those who are already suffering the disease but have not yet suffered any fractures to rebuild bone strength. Drug treatments can help restore levels of oestrogen in those who have stopped producing it, or target it to where it is needed in people who have low levels of the hormone. These therapies include including hormone replacement therapy, oestrogen derivatives and a new generation of drugs known as selective oestrogen receptor modulators. The National Osteoporosis Society offers factsheets for sufferers. They can be obtained by writing to The National Osteoporosis Society, PO Box 10, Radstock, Bath BA3 3YB, UK or by phoning 01761 471771.